Looking for a high-quality shower/bath chair? Get the DR. MAYA SHOWER CHAIR! What makes DR. MAYA’S CHAIR unique? ADJUSTABLE – Height expands 13.77" to 19.68"
WIDER SEAT THAN OTHERS – Measures 10.62" by 17.32"
– Seat – 10.62" x 17.32"
– Inside measurement of the legs – 11"
– Grip Handle - 11.41" x 3.75" x 3.34"
Ideal for the elderly, disabled, or those who have trouble bending, stretching, suffer from arthritis, recent knee or hip surgery, or are rehabilitating. Get your DR. MAYA SHOWER CHAIR by clicking "Add to Cart"
Shower with comfort, safety & confidence. ✅ STURDY, SECURE & DURABLE: This heavy duty shower bench does not wobble and it can hold up to 300 pounds of weight. Made from HIGH QUALITY materials: corrosion resistant aluminum legs that will not rust or corrode. You can easily adjust the height, and the chair can be assembled in minutes. ✅ VERSATILE & COMFORTABLE: WIDE SEAT with drainage holes plus 3 wide seat handles for easy gripping, lifting, and extra safety; anti-slip rubber feet are on each leg offering more support and no sliding on a wet surface. Removable back support allows users to customize chair based on specific preferences. ✅ FITS ALL TYPES OF TUBS: Dr. Maya bath chair is designed for SECURITY, COMFORT, EASE OF USE and specially designed to fit small or narrow tubs plus the adjustable height feature to accommodate wide range of users. 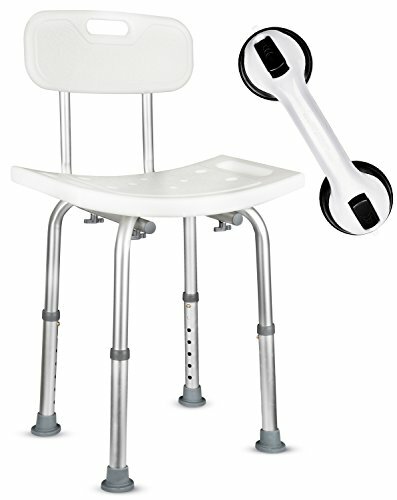 ✅ FREE GIFT & FREE SHIPPING: Each Dr. Maya shower chair with backrest comes with white and black 12 inch shower handle for added safety and security. ✅ SATISFACTION GUARANTEE: BUY WITH CONFIDENCE! Because we know our product is high quality, we want you to be happy; if you are not completely satisfied, please contact us immediately so we can rectify the situation; we are committed to customer service and maintain a 100% customer satisfaction guarantee. If you have any questions about this product by Dr. Maya, contact us by completing and submitting the form below. If you are looking for a specif part number, please include it with your message.